Technology transfer is a big topic for scholars and policy makers.We would like to know how we can harvest the knowledge and ideas that are produced at universities and research institutes and to make them available to society. The invention of new technologies is only a first step. They need to be commercialized as innovative products and services to further foster a society’s wealth. Especially Europe could do better here. The fact that Europe has a comparatively strong academic system but lacks an effective technology transfer from academia to the business sector was recognized under the name “European paradox”. In 2002, Germany passed a new law which aimed at overcoming this paradox. In a recent ZEW discussion paper (Czarnitzki et al., 2015), people from my department have looked at the effect of this law change. I don’t want to spoiler too much, but it looks like the policy didn’t produce the desired outcome. The law change tried to incentivize German academics to engage in technology transfer by abolishing the so-called “professor’s privilege”. This privilege granted German university professors the intellectual property rights (IPR) to inventions that were made while they were employees of the public sector. It was a privilege in so far that usually, for all other professions, the IPR belongs to the employer who funds the research, not the employee. The inventor ownership model under the professor’s privilege was changed to a university ownership model. Now, the institution got the right to commercialize and license new technologies in the form of patents. Inventors were compensated by 30% of the resulting revenues. But how can less monetary compensation provide higher incentives for commercialization? Policy makers had in mind that professors might be too busy with doing research to bother with making money from their inventions. If they are too engaged in science professors might simply not care for selling their discoveries. The university, by contrast, could establish an effective infrastructure for commercialization. Technology transfer offices at every faculty could deal with the patenting process and profits would be shared such that all involved parties – inventors, the university, and buyers – benefit. However, the paper shows that this argument was based largely on wrong assumptions, because it doesn’t apply if scholars already have active connections to industry partners. In collaborations with the business sector, costs for patenting and commercialization of results are largely incurred be the industry side. Professors who hold the IPR to their inventions can bargain bilaterally with their partners over the profit shares. In this case, a shift to a university ownership model does not lower their personal costs but rather decreases their personal benefits as the university now gets a large piece of the cake. Thus, the overall effect of the law change depends crucially on the composition of the overall population of German university professors. Are there more professors with no existing relationships to industry partners who would benefit from the university ownership model through lower costs? Or is it the other was round and the abolishment of the professor’s privilege decreases incentives to commercialize new technologies? It turns out to be the latter case. In order to estimate the effect of the law change, the paper makes use of a suitable control group for comparison. In Germany there is an important system of public research organizations such as Max Planck, Fraunhofer, and Helmholtz institutes. These institutions are complementary to the university system and conduct research in a comparable way. However, the professor’s privilege never existed for scientists at these institutions. The paper compares the patenting activities of university professors before and after the law change with what happened to patenting of non-university researchers. Such a difference-in-differences strategy is able to segregate the effect of the law change from the overall time trend in patenting that affected both groups of researchers. Time trends of individual patenting activities of university professors (blue line) and other researchers at public institutions (red line). The vertical line indicates the time of the law change. In general, we observe a negative time trend in scientific patenting in the period from 1998 until 2008 (see Figure). Both groups of researchers, at universities as well as other public research institutes, filed less patents during these ten years*. 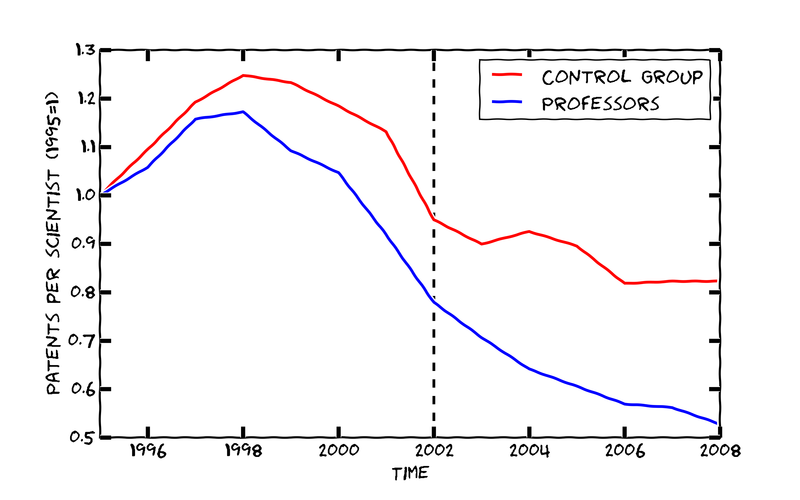 But from 2002 on, the trend becomes even more negative for university professors. Compared to the control group of researchers at public research organizations, university professors slow down their patenting activities even further. This effect can be attributed to the abolishment of the professor’s privilege. On average, the law change decreased patenting of university scholars by around 18%. 78% of the university professors in the sample had existing relationships with the business sector. For this majority of the cohort, the abolishment of the professor’s privilege lowered the incentives to engage in technology transfer. The personal costs of patenting were already quite low for these scholars, as their industry partners took care of the patenting process. By contrast, prospective gains of patenting were significantly reduced. This is another example for how crucial individual incentives are for the effect of an economic policy. The abolishment of the professor’s privilege was almost an one-to-one copy of the Bayh-Dole Act in the Unites States from 1980. We do not know what the effect in the US was. But the paper tells us that the overall effect of an university ownership model, at least in the short run, depends on the industry-science links within the population of inventors. Professors with few relationships to business partners might benefit from lower costs. Whereas professors with active relationships face lower overall profits from patenting and decrease their activities accordingly. * Possible reasons for the negative time trend are “an increased emphasis on publications in academic performance evaluations, decreased entry into academic jobs, the end of the New Economy boom, and legal uncertainties surrounding patenting in the field of biotechnology” (Czarnitzki at al., 2015, p. 14.). Czarnitzki, D., Doherr, T., Hussinger, K., Schliessler, P. and A. A. Toole (2015): “Individual versus institutional ownership of university-discovered inventions,” ZEW Discussion Paper 15-007. Next Next post: Why is Apple sitting on a pile of cash?